Hello back interior lovers! Had a bit of no blog, no internet, no mobile time in Tuscany. A refreshing experience in the always-online social-media centered times. Highly recommendable! It’s been also an inspirational time. 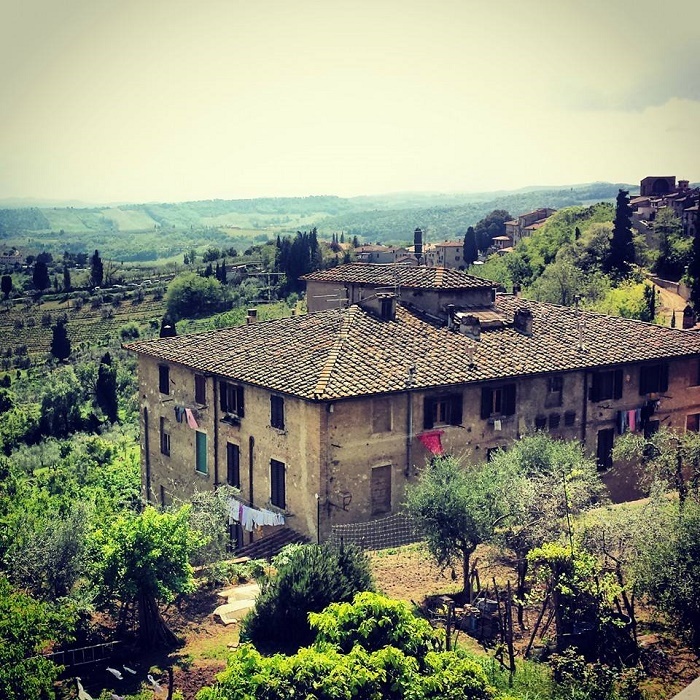 Rural Italy is a beautiful getaway and gives one plenty of ideas on how to make your home a bit rustic. Just to make you a bit jealous;). This is where I found those inspirations. By a glass of locally made chianti. When you think rustic, you think warm, bright, natural and inviting, which to me sounds like a perfect description of a home. Of course not everyone lives in a villa in Tuscany or Provence with a vineyard in the back (what a pity though), so the trick is how to give that relaxed touch to your home, wherever that is, Soho London included. If you happen to live in a house/apartment with such architectural features as wooden beams or stone work, try to bring it out, adapt your interior to highlight their natural beauty. The easiest way is to light them up by creating little pools of light around them, preferably dimmed, so it gives a room a warm feeling instead of a hospital style super bright, almost white light, created by ceiling pendants. Put a desk lamp next to your favourite piece of furniture or Christmas style plain lights around your wooden desk. Another tip is to celebrate those natural features by contrasting them with something modern in a high voltage tone, like electric blue or raspberry pink. Contrasts make interiors sophisticated. In order not to overdo it, you should mix it with earthy colours, which will also perfectly match wood and stone. In the end you want to surround yourself with intriguing but harmonious interiors. Floors. In my humble opinion, the most important and so often neglected element of any interior. Panels are a mistake! They should be forbidden. Wooden or stone floors create magic, especially when old. Personally love it when an old wooden floor starts ‘talking’ to me when walking on it at night. It gives me an interior thrill! If you want a piece of countryside at home, go for wooden floors. If you want something rough and and are not obsessed with the sense of squishiness like me, dare to have a stone floor. Finally, create layers. Mix wood and brick with soft fabrics, such as wool or silk (blankets, cushions, curtains), use different shades of light, don’t be scared of colours (go for rough and painted wood). That creates frictions, which in case of interiors are super cool. This is how you make the space around you iconic. The game of textures, fabrics, colours and light. This entry was posted in Countryside home, home interiors, interior decoration, Interior design, Interior inspiration, interior style, interior trends, interiors, Rustic design, Rustic interior, Rustic style and tagged countryside home, decorating with colour, personal style, rustic & modern, rustic design, rustic interior, rustic interior design, rustic style, Tuscany home, wood at home. Bookmark the permalink.